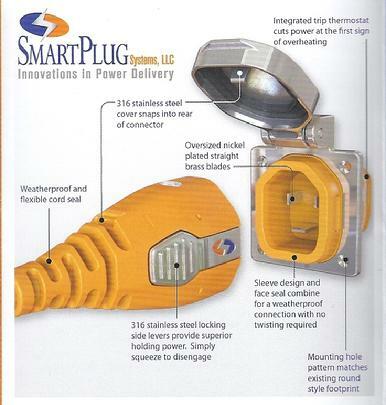 The SmartPlug is a revolutionary shore power system designed to replace the outdated adn problematic twist-type standard in use today. It's intuitive to use and provides greater protection against loose connections and corrosion - the leading causes of shore power failure and fires. Give us a call and we'll be happy to provide you with more information on this product. The SmartStart control is a unique device that smoothes out startup power demand instead of spiking it. In some situations, this gentler method of handling power surge can mean the difference between keeping the generator you have or investing thousands of dollars in a larger generator. A SmartStart control can be added to your air conditioning system for a small fraction of the cost of upgrading your generator. Banish the airborne odors of tobacco smoke, mildew, mustiness, chemical vapors and toilets and inhale fresh, clean, healthier air. The Breathe Easy Air Purifier is an in-line ductable air purifier that uses innovative Photocatalytic Nano-Mesh technology with ultraviolet (UV) light to destroy airborne biological contaminants and odors.